IRI data for the 40 subsequent weeks to February 2019 shows value white cider down 73.3% and value amber cider down 54% year on year. Own-label products have also collapsed amid a drastic shift in the market, but there are several big winners too. In the 12 weeks to February, ale sales rose 8.3% in volume and 15.2% in value in Scotland, compared to growth of 1% and 2.3% respectively in the rest of the UK. Premium cider is also enjoying 9.4% growth and craft cider is up 22% in Scotland, while mainstream brands such as Strongbow and Magners are growing, along with world beer and mainstream lager. Buckfast sales are surging as the tonic wine did not suffer any price rises, while it is interesting to note that K cider at 8% abv and Scrumpy Jack at 6% abv have also benefited from increased sales as Scottish shoppers look for alternatives to the high-strength ciders they had previously been drinking. Wales is poised to introduce a 50p MUP this year and England could follow suit, so producers and retailers are watching developments in Scotland closely. 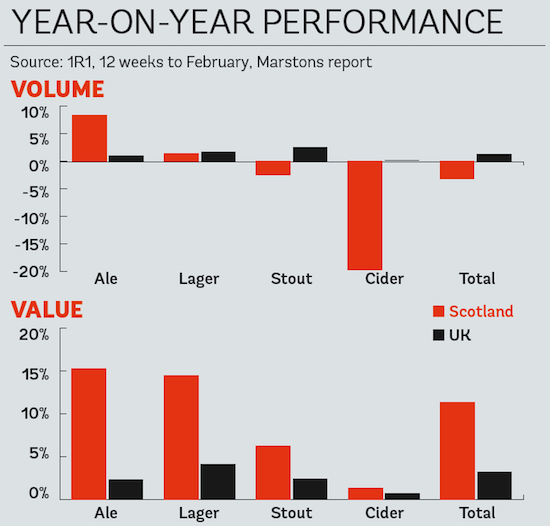 In the 12 weeks to February, total beer and cider volume was down 3.2% in Scotland, while volume sales were up 1.3% in the rest of the UK. However, value sales have risen by 11.3% in Scotland, versus 3.2% in the rest of the UK. That is because the average price per litre has risen 56p in Scotland. Mumtaz Ali, owner of Mace convenience store in Edinburgh, told DRN: “My sales are up 20% since MUP was introduced in Scotland. I am now seeing good sales of multipacks of beer and cider, so eight, 10 and 12-packs and some bigger ones. We can now sell these at the same price as a supermarket can and we get a good margin on them too. I will definitely add more of those in the near future. DRN columnist Gemma Cooper, commercial business partner at Nielsen, reports that total BWS volume sales are flat in Scotland, while value sales have grown 8% since MUP was introduced. That suggests MUP is not achieving its actual aim – to reduce alcohol consumption in Scotland – and instead is simply skewering the market in different directions. Another DRN columnist, industry commentator Paul Chase, called MUP a bad idea that is proliferating like a virus and highlighted that volume sales actually grew 3.8% in Scotland last summer after MUP was introduced (IRI, April 20-October 13). He also laughed off suggestions that last summer’s sales were up because Scottish drinkers were keen to cheer on England in the World Cup. “But a big change in regulation creates new winners and losers,” he added. “The big loser is own-label. This has collapsed in every category or been withdrawn as it now has no place in the pricing hierarchies. “Many of these were lower-strength products bought by low-income consumers – which demonstrates the regressiveness of this pricing reform. It always was about pricing alcohol out of reach of the poor even though the locus of alcohol abuse is among the moneyed middle classes.